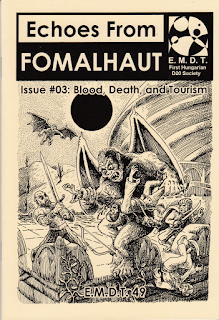 I am pleased to announce the publication of the third issue of Echoes From Fomalhaut. 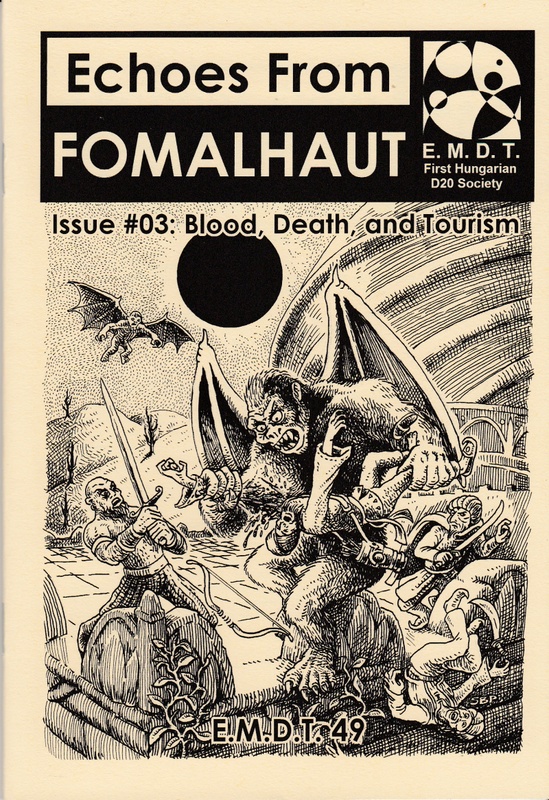 As before, this is a zine dedicated to adventures and GM-friendly campaign materials for Advanced old-school rules, with illustrations by Stefan Poag (who did the cover for this issue), Denis McCarthy, and various long-dead Victorians. Blood, Death, and Tourism is centred around two longer articles. The first is an adventure module set on Tridentfish Island, an exotic island resort gone to rot, and currently being rediscovered by visitors from a sinful and decadent city state. Ancient mysteries and perplexing discoveries await! This article is the first published adventure from our City of Vultures campaign (the second on the world of Fomalhaut). Further issues will explore the city and the nearby lands in more detail. The other large article describes the eastern half of the Isle of Erillion, with its ruins, castles, mysterious forests and inhabited settlements. From the city of Baklin to an archipelago of pirates and Northman raiders; and from gloomy highlands to magical forests, the hex entries provide half of a vanilla fantasy setting suitable for sandbox play. Erillion is easy to use on its own, or to place within the GM’s milieu of choice. The issue also includes a fold-out hex map of the island (the less accurate and less detailed player’s map was published in Issue #02). Two smaller articles are also included: one adapts the beasts of Wizardry VII: Crusaders of the Dark Savant to Advanced old-school rules, while the other presents a mystery from the wastelands of Fomalhaut. What is the Great Wheel and who are the hosts who follow on its trail of devastation? The answer to at least one of these questions is revealed in Echoes #03! I preferred Wizardry VI: Bane of the Cosmic Forge to that much more popular and eye-candied sequel, even though it was quite linear design-wise. Anyways, interesting to see CRPG material on the tabletop. A lot more potential could be in this, for example, giving full potential to those otherwise pretty cool settings/ideas in CRPGs that were wasted opportunities due to crappy videogame design and the lack of improvisation+interactivity on that platform. I prefer Crusaders, but make no mistake, Bane is a great game as well. However, its monster roster consists almost entirely of creatures which are already in the AD&D Monster Manual. Monsters of Wizardry sounds cool, can't wait to get the issue! The Big Wheel with it's entourage was a true pleasure to absorb!